Whew, it's been a crazy week! We had our major performances yesterday and of course, my camera battery died. I'll try to scrounge up some pictures of highlights but until then, here's a new Featured Friend Friday! This time, I met with Tasia of Sewaholic. She's an awesome seamstress and creator of one of my favorite blouses, the Pendrall blouse that I made in a polka dot print. She just released a new pattern for a skirt that I can't wait to try out! I hope you enjoy the interview and be sure to check out her site and her great patterns! Tasia in her fantastic Pendrall blouse! Everything! Sewing is constantly on my mind. I'm always thinking of new ideas, of things I want to make, details to test and add to garments. Fabric is a major source of inspiration for me. I love touching new fabrics, and imagining what they could become. Especially when the seasons change, and the tweeds and wools are replaced by bright prints and soft summer voiles! 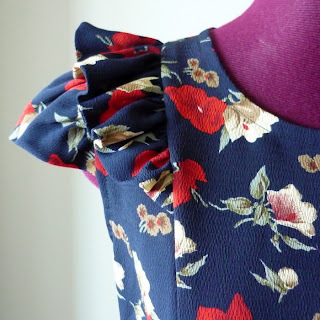 I'm also inspired by the technical side of sewing and love buying vintage patterns just to see how they go together! Currently I'm working on a vintage vogue dress pattern from the early fifties. It has the most fascinating tab-and-button construction! I'm inspired by fashion magazines, by the fabulous projects made by other sewing bloggers, by trends and themes. The best part about sewing is knowing you can take any trend and make it your own. Want a maxi-skirt for summer? If you sew, you can make one in the colour you like best, with the fabrics you like to wear, and you can make it to fit you perfectly! That's a wonderful sense of freedom. You're not limited to what's in store, at the price you can afford, in the sizes the store carries. Half of our spare room is mine, for sewing and blogging! I've maximized my space by hanging thread racks on the wall, using bookshelves and boxes for storage, and keeping fabric stored away in the closet. Having a bulletin board for swatches, sketches and a calendar helps keep me super organized - and therefore more productive! I love the natural light, and I love the thread racks. I long for more space, or a space I can call my own. Don't we all wish for more sewing space? Swoon! So practical and so colorful! Let us in on your stash... what’s coming, what’s in progress, what are you stumped with? Ooh.. What's in progress is my Vogue dress, in lovely turquoise wool and the most expensive button I've ever purchased! What's coming? A Sew-Along for the Crescent skirt, my most recent pattern design! I'm looking forward to leading another Sew-Along after the first one was so much fun. I'll sew a skirt along with the group, for demonstrations and of course, because I can use another skirt in my wardrobe! After that, I'm hoping to whip up one of the Vogue re-issue patterns I got recently. There's a dress pattern from the forties with a fantastic draped, gathered, and sash-tied bodice that I can't wait to make up! Colette Patterns' Crepe dress is still on my mind for spring, I love the idea of no closures and a bright contrast sash! And of course, I'm working on the next pattern for Sewaholic Patterns. There's always lots of sewing in my world! What am I stumped with? Pants. Everything to do with pants - wearing them, sewing them, designing them. It's a challenge I'd love to tackle, as so many people who sew are terrified of sewing pants! I know that a lot of that fear comes from fitting issues, especially us who have a curvier bottom half. So I'd love to create a pants pattern for pear-shaped women, that would make it easier for us to get a great-fitting pant. Once you have the pattern and the fitting done, sewing pants is a breeze! So that's where I get stumped - solving pants for me and for pear-shapes everywhere. What is your favorite craft to work with? Sewing! By far. I have great intentions of learning to knit, but there's just so much sewing I want to do first! I don't scrapbook, or embroider, or bake. I sew, and sew a lot! There's always something new to learn, a new technique to explore, a tricky fabric to master. With sewing I feel like there's no limit. Tailoring, sewing lingerie, fitting different bodies - every challenge is an opportunity to master a new skill! What is your favorite thing that you’ve created so far? Good question! Can I have more than one favourite? My favourite project, start to finish, was the Picnic Dress. It's pink, it's flowered, it's so delightfully girly and pretty. The full skirt is so fun and the bodice fits like a glove. I'm really proud of the hand-picked zipper and the waist stay, two authentic vintage details! Although I haven't worn it yet, I'm looking forward to warmer weather so I can take Mr Sewaholic on a picnic and dress for the occasion. My second favourite thing I've created is the Pendrell Blouse. It was a wonderful feeling of accomplishment, taking a design from concept all the way to printing and selling a pattern! There's no way to describe the feeling when I see someone else make it and love it. And despite the fact that I've made this blouse nearly a dozen times, I still want to make more! It still happens that I'm at the fabric store, see a gorgeous cranberry stretch silk georgette (!) and think, that would make a great Pendrell! A memorial... and a housewarming!